A 33 year-old Wellington woman, Lindsay Nicole Blansett, is being charged with murder in the first degree after allegedly killing her 10 year-old son late Sunday night. The formal complaint filed by county attorney Kerwin Spencer says the woman “intentionally and with premeditation” killed her son, Caleb Blansett. Charges were filed about 4:30 p.m. It further alleges she took a rock and a knife into the bedroom where the boy was sleeping. She is accused of hitting him with the rock and then stabbing him in the chest with a knife. “That is what we intend to prove,” Spencer said. There is a court appearance set for Thursday at 1:30 p.m. at the Sumner County Courthouse. The charge is murder in the first degree, which carries a potential life in prison sentence, Spencer said. Police answered a 911 call just before midnight, and found the boy. The woman was in the house and taken into custody. Wellington Police Chief Tracy Heath said he was awaiting an autopsy report, which was conducted in Wichita Monday. The house is on the corner at 902 W. 7th Street in Wellington. Police had the area taped off and had several police cars and a trailer at the scene Monday morning. Police we wearing protective gear and carrying bags out of the house. The child was a student at Lincoln Elementary School. Another child, a nine year-old girl, was taken into protective custody and later released to family members. School officials confirmed that a student from Lincoln Elementary School had died. Counselors are being made available to students at the school as needed, a school official said. Tracy said as far as he knew, there were no drugs involved in the incident, and no other illegal activity. He also said there were no other suspects. The first court appearance for Lindsay Nicole Blansett, 33, Wellington, who is accused of killing her 10 year-old son Caleb Blansett, went quickly Thursday morning. 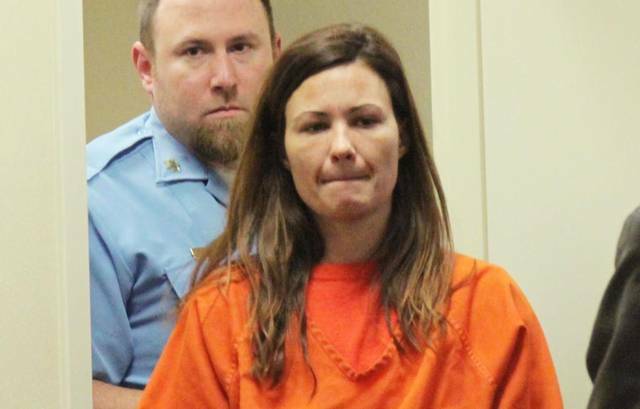 She was brought into the courtroom wearing an orange prisoner outfit and in handcuffs. She looked straight ahead or down in the few minutes she was in the courtroom. Court appointed defense attorney Mike Brown asked for more time to review the case, and the hearing was continued until Jan. 8. Prosecuting attorney Kerwin Spencer said the next step would be for Brown to decide whether to ask for a competency hearing or to move ahead with the preliminary hearing. Brown said he introduced himself to the defendant just before they entered the courtroom, and he has had very little time to go over the particulars of the investigation. Spencer said he too was still gathering information for the case. The appearance Thursday took less than five minutes. She is accused of hitting her son with a rock, and then stabbing him to death late Sunday night. The call to EMS came in just before midnight and rescue workers found the child dead. Spencer said the woman was apparently distraught over her living situation, and decided the boy would be better off in heaven than alive. Since that time, the child’s father, Clint Blansett, said he has filed complaints in the past about the children’s welfare with the state authorities. Clint Blansett was at the house at 902 W. Seventh in Wellington Friday afternoon and was arrested on a theft warrant. He was quoted by an area TV station as saying he thought the state did little to protect his son. There was also a nine year old daughter in the home who was taken into custody and later released to family members. Caleb Blansett was a student at Lincoln Elementary. A fund has been set up for Caleb Blansett at Impact Bank. You can send your donations to P.O. Box 398 Wellington, KS 67152. Funeral services for Caleb will take place at 3 p.m. on Saturday, December 20th at First Christian Church in Wellington. Visitation hours at Day Funeral Home in Wellington are set from 1 p.m. - 8 p.m. Friday, December 19. Online condolences can be left at www.dayfuneralhome.info At 7 p.m. on Saturday, people are invited to gather at Heritage Park, beside the Memorial Auditorium, to sing and pray with the family of Joe Moralez who organized the event. Nicole Blansett’s defense attorney has asked for a court order banning attorneys from discussing her case with the news media, Sumner County attorney Kerwin Spencer said Monday. Blansett is accused of fist degree murder in the death of her 10 year-old son, Caleb Blansett. Court appointed attorney Mike Brown has also asked for a mental competency exam. That request is normally granted, and likely will be at the hearing set for 1:30 p.m. Thursday at the Sumner County courthouse. Spencer said the request for a competency examination is normally granted by judges. The other request is also common, but not one Spencer necessarily likes. “Government sunshine is better than government secrecy,” he said. The hearing on the request to ban attorneys from talking about the case will be set Thursday and could be held Jan. 15. A few more details in the murder charges against Blansett became available when the official “probable cause affidavit” was released last week by the state. The report details the police investigation and report on the night Nicole Blansett allegedly murdered her 10 year-old son Caleb Blansett. Much of the report was redacted, or edited, at the request of the defense attorney. The details of exactly how the murder happened, and what she said to police about it, were the parts that were edited. These details may be released when the case goes to trial. The murder happened on Dec. 14.